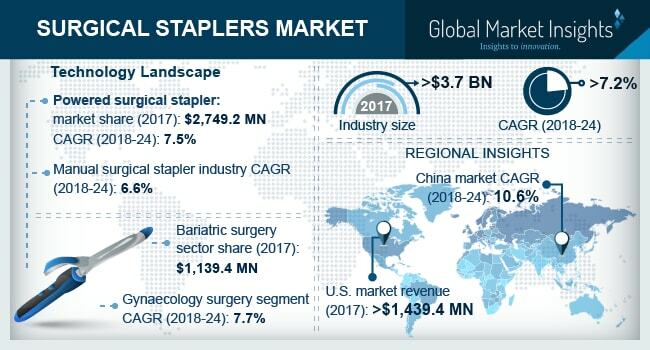 Surgical Stapler Market size is set to exceed USD 6.1 billion by 2024; according to a new research study published by Global Market Insights, Inc.
Increase in number of surgical procedures across the world will augment the surgical stapler industry growth in the forthcoming years. The use of surgical staplers has increased in the past few years in most common types of surgeries such as cardiovascular and general surgeries. Almost two-third of the hospitalized cases involve in some or the other surgical procedure. Increase in number of patients with chronic diseases in North America, that ultimately need invasive surgical procedures such as bypass surgery and other major complicated surgeries will contribute to surgical staplers’ industry expansion over the forecast period. Rise in the adoption of surgical staplers over sutures in several surgical procedures in developing regions of Latin America owing to the numerous benefits such as being economical, accurate, speed, efficacy of the device and causing fewer infections than stitches. Thousands of surgical interventions are performed annually in Latin America and wound related complications are one of the major reason for patients that undergo surgical procedures. Prevalence of traditional wound closure practices in developing regions of Asia Pacific will be one of the major growth restraining factor. Despite the recent technological advancements in wound closure procedure, there are certain regions that still practice traditional methods and therapies for wound closure. Countries with lower economy will have low product adoption rate resulting in impeding industry expansion. Linear surgical stapler segment held a significant market share with a total value of USD 1,133.6 million in 2017. Linear surgical stapler is more prevalently used in gastrointestinal system (GIS) anastomosis and other anastomosis procedures. Increasing use of linear stapler in anastomosis surgery procedures will enhance the industry growth in forthcoming years. Powered surgical stapler business is estimated to show significant growth in the forecast timeframe at CAGR of 7.5%. Increase in research and development activities have led to many advanced stapling devices that have been predominantly used in several surgical procedures. Also, according to the studies it was observed that the use of powered surgical stapler resulted in minimum post-operative complications such as bleeding and infections. Reusable surgical stapler business valued at USD 1.2 billion in 2017. Reusable staplers generate very less surgical waste and also are easily available at an economical price in the medical stores. The reusability of the staplers will increase the product demand and adoption rate in the coming years resulting in business growth. Gynecology surgery industry will witness significant growth in the forecast period at CAGR of 7.7%. The rise in number of births across the world via caesarean surgical procedure will result in boosting the growth of surgical staplers market in the gynecology surgery segment in the future. Germany dominated the European surgical stapler with a total value of USD 276.7 million in 2017.Germany is the most populated country in the Europe region with around 82 million inhabitants, of that 22.2 million were aged 60 and over. Rise in number of chronic diseases in adult population and technological advancements in the country will favor the market growth in the upcoming years. Prominent industry players include include 3M, B. Braun Melsungen AG, Conmed Corporation, Ethicon Inc., Frankenman International, Grena, Integra Life Sciences, Intuitive Surgical, Medtronic PLC, Meril Life Sciences, Purple Surgical, Reach Surgical, Smith & Nephew PLC and Welfare Medical. The industry players focus on strategies such as merger and acquisition, new product launch and geographical expansion in order to enhance their market presence across the world.